Let me propose the neologism “monumentaries” to describe the notion that monuments are not just material documents of the past, but also the expression of a contemporary editorial point of view. Monumentaries are historical buildings that have been purposefully altered post facto in order to influence our perception and conception of them. Any careful observer of historic buildings knows that, in order to keep them standing over the centuries, some measure of alteration is always necessary, but that doesn’t make every monument a monumentary. We have to distinguish between alterations due to low-level maintenance, like replacing a couple shingles to fix a leaky roof, and alterations made to express an idea, like replacing a metal roof with clay shingles in order to create a more historically accurate image of the building at the moment of original construction. Only the latter type of alteration, insofar as it is justified by both a technical need and an intellectual proposition, is an intentional attempt to turn the monument into a monumentary. Monumentaries are both material and conceptual objects meant to operate discursively in various social, cultural and political realms, as well as disciplines such as architecture, art, history and others. I will focus in particular on the material that is added to monuments in order to transform them into monumentaries. This material, while often presented as a purely functional repair meant to be invisible, or at least dismissible, is in fact a very important aspect of the aesthetics of monumentaries. As modifying aesthetic, it also operates as a conceptual supplement, able to reconfigure, sometimes slightly, other times completely, the ideas previously associated with the monument. While material supplements to monuments are typically intentionally obvious and easy to see, their conceptual status is paradoxically rather difficult to decipher. Building on Derrida’s analysis of artistic parerga, the supplements described in Kantian aesthetics, I will argue that monumentaries are created through supplements that are both the same and different than those at work in other artworks: the same in the sense that they are conceptually extrinsic to the work, materials that need to be removed in order to appreciate the work, but paradoxically indispensable and therefore constitutive of it; different in the sense that they are meant to physically and conceptually protect and preserve the work for the future. What follows is an attempt to refine the concept of the supplement as it pertains to architecture by theorizing the apergon, the part of architecture that protects it until it will have been fit to stand on its own, that is to say fit to be understood. Limestone supplements frame the original stones of the ancient Roman theater in Arles, France. Photo: Jorge Otero-Pailos. As in film documentaries, architectural monumentaries must strike a careful balance between staging historical evidence objectively and presenting the filmmaker’s or the architect’s subjective editorial point of view. In the ruins of the ancient Roman theater of Arles, France, the editorial point of view of the contemporary architect appears as an attempt to present a speculative image of what the ground-level arcade of the theater’s façade might have looked like when it was originally built in the first century BCE. Pedestrians walking the perimeter of the theater, along the Rue de la Calade, are presented with a white iron fence placed along the exact location where the ancient façade once stood. A few blocks of limestone that were clearly the base of the façade interrupt the fence. As the visitor nears the northwest corner, these blocks rise up and turn into a one-story wall with three arches flanked by Doric pilasters. The limestone ashlar is crisply rendered, suggesting that it was laid more recently, during a major restoration campaign carried out at the end of the nineteenth century, and retouched between 2005 and 2009. The physical building material that makes up monuments can sometimes be an opaque document—difficult to read. Precisely this opacity legitimates the need for a contemporary supplement that will illuminate its meaning—document and supplement are mutually constitutive. But the supplement, by definition, needs to appear secondary to the document, even if without it the document cannot function as such. So contemporary architects have to pour a great deal of creative effort into making their work appear reversible and unobtrusive, even if, in the case of the Arles Theater, it would be physically impossible to separate the new stones from the ancient Roman ones without inflicting some degree of material damage to the latter. Supplemental brick scenae frons and Tudela stone cavea seating frame the original stones of the Roman theater in Sagunto, Spain. The design by Giorgio Grassi and Manuel Portaceli was completed in 1993 and received with much criticism. Photo: Iniguez Rodriguez Enrique, Wikimedia Commons. But how do we know if we are expressing a supplement too obviously or too indistinctly? Let’s look at an example that has been condemned for being excessively obvious: the monumentary created by architects Giorgio Grassi and Manuel Portaceli at the ancient Roman theater in Sagunto, Spain. The ruins that remained in the 1970s were mainly the three tiers of cavea, or semi-circular rows of seating. The scaenae frons, or high enclosing wall behind the stage, was entirely missing, save for the foundations. Grassi and Portaceli wanted to create a monumentary that would convey the original architectural experience of an ancient Roman theater. They were designing in 1985, during the years of postmodernism, at the height of the Italian school of typological urban morphology, which Grassi, Gianfranco Caniggia, and Gian Luigi Maffei helped shape, and which Aldo Rossi and Rafael Moneo disseminated internationally.3 In order to express the ideal of the Roman theater building type, Grassi and Portaceli thought it essential to construct a new wall behind the stage as high as the original scaenae frons. They were very careful to make it very obviously contemporary, building it out of unadorned yellow brick to differentiate it from the original grey stone. Following the standard archeological practice of anastelosis—a term initially describing the re-erection of the fallen stele around Greek temples—they inserted some remaining ancient fragments into the new brick wall in order to give a sense of how highly ornate the original scaenae frons would have been. Despite the architects’ attempt to follow convention and render the supplement in an obvious fashion, the project was heavily criticized immediately upon completion in 1993. Preservation architect Antonio Almagro protested: “The contemporary spectator or visitor that enters the space of the theater will find that, of the surfaces presented to his or her sight, not even a fourth part are original Roman remains.”4 The supplement seemed to him too obvious and too overwhelming of the original. It was so present that it could not be ignored, or imagined away. Such was the uproar that the socialist municipality was taken to court by the opposing conservative party. After decades, the Spanish Supreme Court decreed that the supplement had to be physically removed and the theater returned to its “original state.”5 Arguably, this original state was precisely what Grassi and Portaceli attempted to express in their project. But the Spanish Law of Cultural Patrimony forbids reconstructions in new materials, and only permits reconstructions based on the anastelosis of original fabric. Despite the supplement’s clear appearance as something extrinsic to the work, it proved to be impossible to extricate from the ruins. In 2009, the Regional Supreme Court of Valencia argued it was physically, legally, and financially impossible for it to carry out the orders of the Spanish Supreme Court.6 So the supplement still stands. Supplemental plexiglass seating over the original stones of the Greek Theater at Heraclea Minoa, Agrigento, designed by Franco Minissi (1960–63). Left: as built in 1973. Photo courtesy of C. Bellanca. 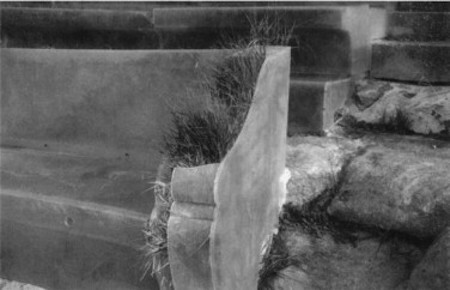 Right: The first level of bleachers with breaking laminate and greenery infestation, 2000, (N. P. Stanley-Price, J. Jokilehto, “The decision to shelter archaeological sites: Three case studies from Sicily,” Conservation and Management of Archaeological Sites no. 5, 2001: 19–34). Almagro’s emblematic critique further cues us to the paradoxical status of the supplement: it must be obviously expressed but also appear insubstantial, in both senses of the word, as a material that can be seen through and that is meaningless. This insight has led some creators of monumentaries to experiment with transparent materials, like glass and plastics. Architect Franco Minissi became well known for his transparent plastic supplements, especially his coverings of the cavea of the Greek Theater at Heraclea Minoa (Agrigento, 1960–63).7 But the norm, as we’ve seen in Arles and Sagunto, is for supplements to be expressed with opaque materials. Using visual techniques such as “phenomenal transparency,”8 opaque supplements can achieve disappearing effects, by carefully matching the original’s regulating lines while completing its missing volumes in order to create the sense of continuity, overlapping fields, depth, and so on. When taking in the monumentary as a whole, supplements appear as a material through which we can glean or imagine aspects of the original that are in fact not there. Done properly, the supplement confounds, blurs the line between reality and fiction, and allows us to suspend disbelief, to satisfy our desire for meaning, to see what we want rather than what is before us: to experience the monumentary as unassailable documentary evidence of the past. The supplement plays on our human propensity towards binary thinking: its materiality is so overdetermined as something artificial and meaningless that it makes everything else around it, namely the original, appear authentic and deeply significant. Monuments without supplements are rare, and for a reason. Recently, a municipal maintenance team discovered a rare unsupplemented six-thousand-year-old Celtic tomb in the Galician village of Ardesende, in northwestern Spain. They confused it with an old picnic table with broken benches, and with the best of intentions, demolished it and replaced it with a new table and benches, made of shiny new polished granite slabs to meet the standards of the most exacting picnicker.9 The site had been documented by archeologists and was officially listed as a Resource of Cultural Interest, but it was never supplemented. Without a supplemental treatment, the monument could not be recognized as such: it was invisible to the untrained eye. Ambiguous legibility threatens the existence of monuments. In order to recognize something, we must by definition have seen it before. This means that it would be theoretically impossible for us to identify a construction we had never seen before as a monument. To survive, they must unequivocally appear as monuments. Supplements are meant to help monuments do what we expect them to do but cannot do by themselves: to appear as monuments. This is their primary role: to impose conventional attributes upon the extraordinary objects that will render them recognizable as monuments, that is, as evidentiary documents of the past. Erechthion’s caryatid column stands in the Acropolis Museum, Athens. Photo: Jorge Otero-Pailos. For any object to be considered evidence—for it to enter a courtroom, for instance—it must first be prepared according to protocols accepted by the court. Scientific techniques supplement the object, collaborate with it, and support its claim to evidentiary status. Evidence is therefore never free of some degree of necessary manipulation—a fact well known to forensic experts. As Eyal Weizman reminds us, forensics is the application of scientific methods and techniques to objects such that they may be recognized as evidence in forensis, the Latin word for an open court.11 At some rudimentary level, the public is aware of this artificial contrivance through the media coverage of, for instance, celebrity court cases. Preservationists too use media to make the public aware that the monuments they visit have been treated in some way. Think of the ubiquitous panels planted in front of monuments to explain what elements have been replaced and with what techniques. Even though they are not physically on the historic object, such panels and other related media are also its supplements, essential to helping it appear as a monument. Every discipline has its supplements, but only some have turned the supplement itself into their central endeavor and benchmark of creativity in the way that preservation has in the production of monumentaries. The annals of preservation theory are filled with treatises and reflections on how to best express supplements. The same is not true in painting, for instance. Painting theory relegates supplements to the margin. The frames we put on paintings help to supplement them by establishing a clear inside and outside of representation. They draw the line between what we should attend to and what we should ignore, what is intrinsic and extrinsic to painting. Derrida named the frame the parergon—from the Greek para, that which is next to the ergon, the work. “A parergon comes against, beside, and in addition to the ergon, the work done (fait), the fact (le fait), the work, but it does not fall to one side, it touches and cooperates within the operation, from a certain outside.”14 The parergon is a supplement to the existing work, a treatment that refashions it slightly, enhances it, helps it achieve the presence and meaning it should have but cannot attain alone. As an obstruction, the monumentary's supplement delays our gratification, postpones conclusive meaning. But it does not deny it. It simply stands in the way of it, holds it in abeyance for a moment in the future anterior, when the monument will have been understood without supplements. The supplement therefore casts itself as a part of the work that must be removed in order to illuminate the work, to fully grasp it. In ancient Greek architecture, this part of the work was called the apergon. A building’s blocks of ashlar were delivered to the construction site unfinished, with rough surfaces. These extra few centimeters were meant as a protective covering for the stone during transport and installation. Once the stone was safely installed, the apergon was struck from the stone as the surface was rendered and the architecture revealed. Perhaps the world’s most famous apergon is the southern wall of the Propylaea, which was never removed because of the drain on Athenian coffers of the Peloponnesian War of 431 BCE. Starting especially in the Renaissance, the apergon was recognized as beautiful in itself and aestheticized as rustication on buildings of all sorts. To recognize the monumentary supplement as the work’s apergon is also to move beyond the tendency in preservation theory to analyze historic buildings according to false dichotomies that divide their fabric into parts: one being intrinsic original documentary evidence and the other cast as extrinsic, derivative, contemporary interpretation. It will bring us closer to grasping monumentaries for what they are rather than what we desire to see them as, and to appreciating the contemporary forms of expression alongside the pasts that they spawn, and the futures they help fabulate, rather than continuing to insist on the traditional concept of the monument as an immutable relic of the past. All photographs appear courtesy of the author unless otherwise noted. Jorge Otero-Pailos works at the intersection of art, architecture and preservation. He has been exhibited at major museums, festivals, galleries and foundations. Notably, Manifesta7 and the 53rd Venice Art Biennial. In 2009 he was listed as one of ten young Spanish artists to watch in Architectural Digest and featured that same year in the BBC TV’s documentary Ugly Beauty alongside Damien Hirst, Anish Kapoor, Carl Andre, and Yoko Ono. He has received awards from major art, architecture and preservation organizations including the Kress Foundation, the Graham Foundation, the Fitch Foundation, and the Canadian Center for Architecture, and in 2012 the UNESCO Eminent Professional Award. He is a member of the Academy of Arts and Sciences of Puerto Rico. Sigurd Curman, “Principles of Restoration: Examples and Desiderata (1906),” Future Anterior, no. 2, vol. 7 (2010): 68. For a good primer on the school of typological urban morphology, see Gianfranco Caniggia and Gian Luigi Maffei, Composizione architettonica e tipologia edilizia: Vol 1, Lettura dell’edilizia di base., Vol 2, Il progetto nell’edilizia di base (Venice: Marsilio Editori, 1979). Antonio Almagro, “Arde Sagunto: La Polémica Restauración del Teatro Romano,” Arquitectura Viva no. 32 (September–October 1993): 67. My translation. Manuel Marín, “El TS echa abajo la rehabilitación del Teatro Romano de Sagunto: Considera que su reconstrucción vulnera la Ley de Patrimonio HIstórico,” Diario ABC, October 18 2000, 48. Beatrice A. Vivio, “Transparent Restorations: How Franco Minissi Has Visually Connected Multiple Scales of Heritage,” Future Anterior, no. 2, vol. XI (Winter 2014): 1–17. Colin Rowe and Robert Slutzsky, “Transparency: Literal and Phenomenal…,” Perspecta 8 (1963): 45–54. Eyal Weizman, “Introduction: Forensis,” in Forensis: The Architecture of Public Truth (Berlin: Sternberg Press, 2014), 9–32. Jacques Derrida, The Truth In Painting, trans. Geoff Bennington and Ian McLeod (Chicago: University of Chicago Press, 1987). Derrida would have argued that the frame is still conceptually there in a frameless painting. The denial of the physicality of the frame is an acknowledgement and affirmation of its conceptual role in creating a border within which the painting is constituted as the site of meaning, and outside of which there is only insignificance. The frame’s invisibility could be read as an unknowing attempt to express its conceptual status as a nonentity. It is worth pausing for a moment to consider how the supplement can be against the work that it is part of. For example, the missing portions of the Erechthion’s caryatid column are supplemented with square masonry and a titanium rod. Physically, these supplements are the work. Without both old and new pieces, the column does not stand up. But they are crafted in a deliberately crude and unadorned way. On the aesthetic level the supplement prevents us from immediately appreciating the aesthetic unity of the work—we must imagine it. At the same time, they prevent the ancient fragments from disaggregating completely. That is to say, conceptually the supplement is positioned against allowing the monument to naturally decay into a formless ruin.